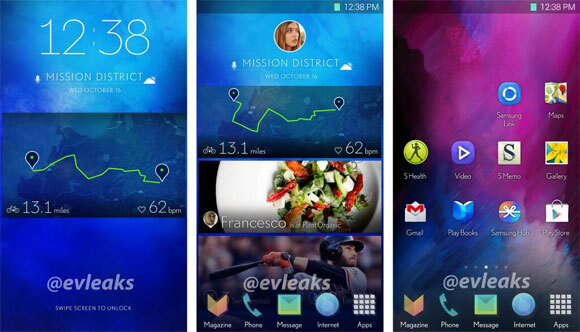 We can now catch a glimpse of an upcoming smartphone user interface that Samsung is currently working on. A trio of leaked screenshots show a phone UI that looks like the next major version of the company’s TouchWiz UI. According to the prominent leakster, Samsung is currently only “exploring” the user interface, which you can check out below. More mature than the current TouchWiz UI versions, the new design is a bit more toned down and feels a bit more rounded. Additionally, the homescreens pack interesting widgets, but at this point we can’t know for sure what they’re doing. We guess Samsung will be ready for the new version of TouchWiz to debut on the upcoming Galaxy S5. It’s rumored that the company is rushing to announce the phone at MWC in Barcelona, although this is yet to be confirmed and it seems more likely that the company will hold its own event instead. We’ll keep you posted on any new info on the subject as it comes.